That’s how it seemed during the second half: the Sparks would work so hard for the basket, and the Dream would just pop it in. – The reason Atlanta is undefeated? McCoughtry with 32, Sancho Lyttle with 19, Iziane Castro-Marques with 24, and Erika DeSouza with 14. They’re fast, they have great defense, and they see the floor and are in sync. How’d they get so good so fast? I don’t know, but they’re good. – The reason LA only has one win? Their defense is horrible. No boxing out, no following the shot. They let Atlanta get away with way too much. And after scoring, the Sparks didn’t get back on defense, so that the Dream answered right away. An exercise in frustration to watch. Pat Summitt’s head would have exploded. 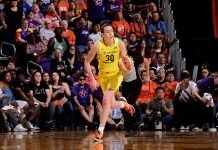 – Ticha Penicheiro may not be THE answer at point guard for the Sparks. She only played half the game again, and in the minutes she did play, she was throwing some crazy passes and looked out of control a couple times. But I think that between her, Kristi Toliver and Andrea Riley – both of whom got a chance tonight – the Sparks will be OK at the one-spot. – Me and those in my row think Coach Jennifer Gillom leaves players in too long. The opposite of the quick hook, players seem to get tired on the floor before she’ll pull them out. – Angel McCoughtry is just silky. Her shot is so smooth, and she makes her trip to the basket look so easy, that it’s deceptive. Iziane Castro-Marques and Sancho Lyttle were 11-16 and 9-14, respectively. Did the Sparks make adjustments for them? No. – Tina Thompson was 9-11 on two-point shots and 5-7 on three’s. It was a sight to behold. Two of her three’s were NBA-range. Twenty-six points? Booyah. 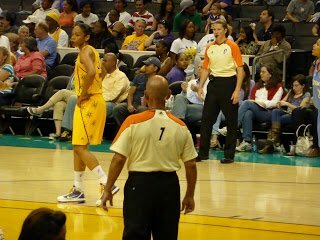 – Candace Parker, doing everything again. Thirty-three points, 12 rebounds, six blocks, two assists. She was all about the head fakes tonight, looking like she was going one way and shimmying to the right. She doesn’t seem to be afraid to take anyone on one-on-one. – I don’t think these stats have been updated this weekend yet, but I wonder how they’ll change on Tuesday? 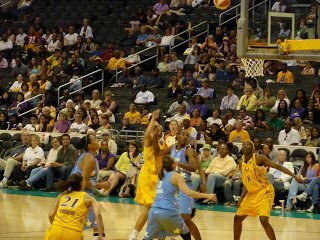 Taurasi, McCoughtry, Parker, Pondexter, Jackson and Taylor for MVP? Jackson had 27 today. They’re all making a strong case for it. 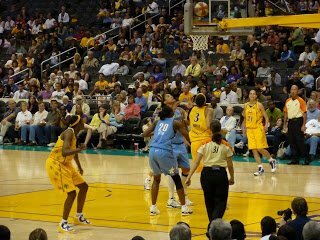 Twas quite a sight tonight to see Parker and McCoughtry go at it, basket for basket. – Until now, Parker and Delisha Milton-Jones have had the coolest player-to-player handshake on the Sparks team. But now I think that honor goes to the special handshake that Penicheiro and Riley have. You gotta see it. – I didn’t take too many pictures tonight because I was a bit deflated. 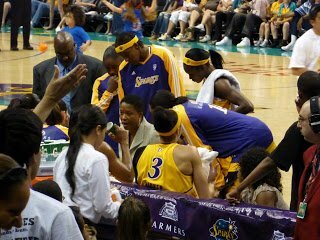 Sparks Coach Jennifer Gillom addresses the team at a first-quarter timeout. Arminitie Price, right, missed this shot, but Erika DeSouza, behind her, got the put back. Do we like the new ref uniforms? 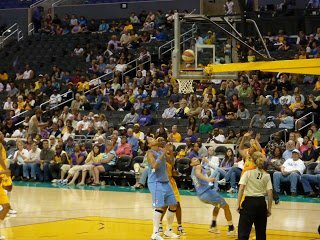 Candace Parker puts up a shot in the third quarter. Delisha Milton-Jones, left, tries to score, but it didn’t happen. She was 2-11 on the night. As for Angel, she's just finally getting a chance to do what Tom Collen and Jeff Walz realized she could do at Louisville. Make everyone around her better and coordinate the effort. Plain and simple – Angel was doing it all and the Sparks has NO answer. I thought they played well in the 1st half, but the 2nd half was a bust. NO DEFENSE – not even a little. Did they not watch tape of what Atlanta could do? I knew, so why didn't they. Candace and Tina looked great. But that's the best I can say about the game from a Sparks fan's persepctive.